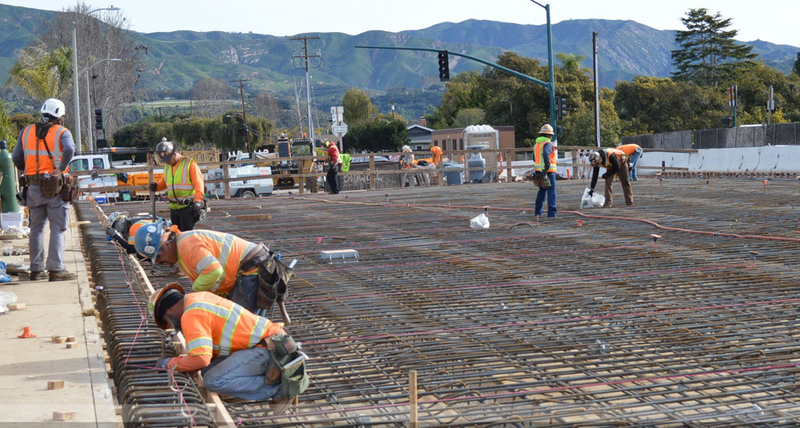 Work crews prep for a concrete pour at the Casitas Pass Road bridge over the 101, while at Linden Avenue the highway will close overnight to allow crews to install falsework supports. Continuing work on the section of Highway 101 through Carpinteria will close the highway at times overnight this coming week. The closure will occur between Linden and Bailard avenues so that work crews can install temporary supports at Linden Avenue. Southbound 101 will close on Wednesday, February 20, from 10 p.m. to 5 a.m., and on Thursday during the same times as needed. It will be northbound 101’s turn on Thursday, February 21, to stay shut overnight. The northbound detour will extend from Bailard Avenue, through downtown and over the freeway to Santa Ynez Avenue and Via Real. The southbound detour exits the 101 at Carpinteria Avenue through to Ballard Avenue.